We’re back with the second part of our gose with fruit, just from where we left, when Safale K-97 was finishing the fermentation, 6 days after pitching after fermenting with Lactobacillus which lowered the pH to 3.30. 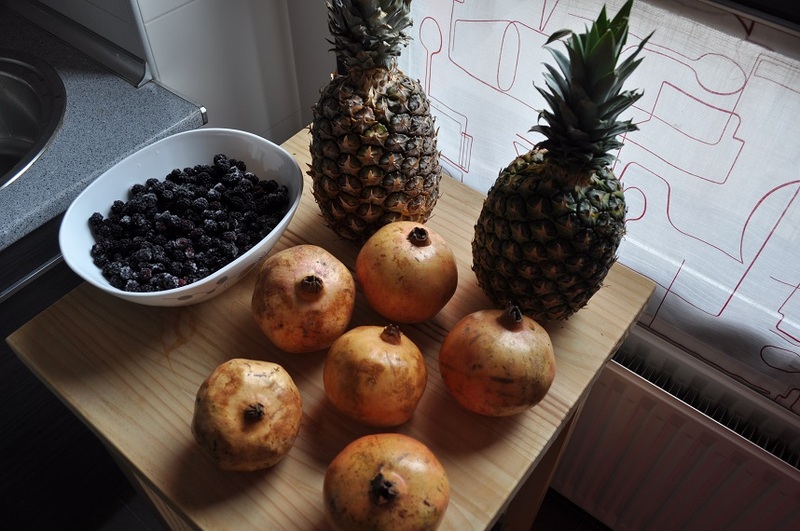 In that entry, we also posted a picture with the fruits we were going to use, pomegranates, blackberries and pineapples. 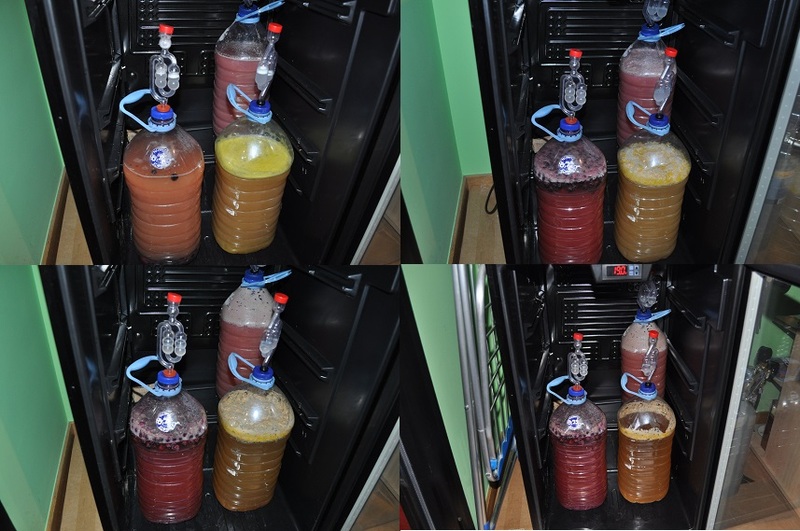 After fermenting the gose base beer, we ended with a little less than 15 liters (3.96 gallons), which we divided in three PET bottles where we would add the fruits. Evidently, these PET bottles were previously sanitized. Densidy was 1.010 at that moment, probably the fermentation was not totally finsished. In this entry we will focus in how we added each fruit and the process it followed until we bottled the beers. For now on, we will refer to the three different gose as Gosegra (with pomegranates), Gosemo (with blackberries) and Gosepi (with pineapples). We’re going to go first with the addition of the blackberries for our Gosemo. 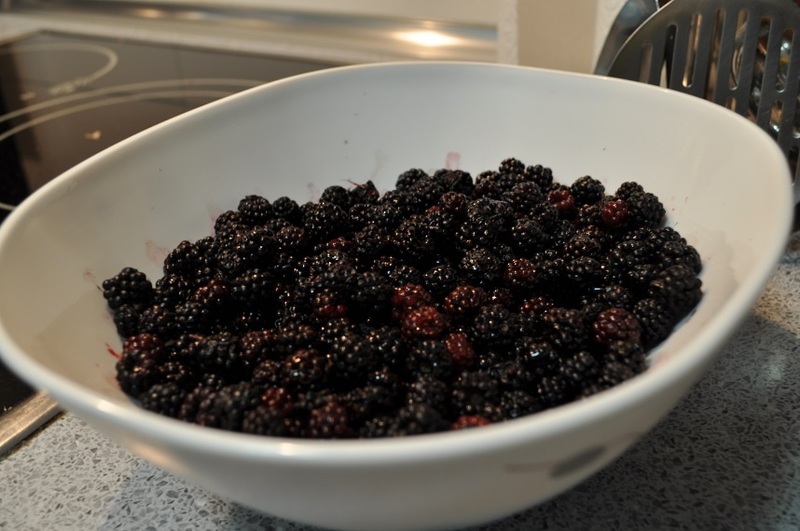 The blackberries we used, about 630 g (1.39 oz), have been picked two months ago and from then on they had been in the freezer. As we were going to do all the process in the afternoon, we take out the blackberries from the freezer in the morning to give them time to thaw. In this case, apart from keeping the fruit in the freezer, the processing was none. We just added the blackberries to the bottom of a PET bottle and then we siphoned carefully about 5.5 liters (1.45 gallons) of the base gose beer. In the case of pomegranates, the process was more complex. Instead of adding them directly, we decided to make pomegranate molasses, a typical ingredient in Middle Eastern cooking. We thought this could be a good way for the pomegranates to impart their flavor to the beer. To do this, first we seeded 6 pomegranates and then we got the juice from a squeezer, obtaining about 1 liter (0.26 gallons) of pomegranate juice. We simmered this juice with the juice from one lemon and 100 g (3.53 oz) of table sugar for 45-50 minutes. Then we let it cool and we transferred it to a PET bottle just before adding about 4 liters (1.06 gallons) of the base gose beer. It was time for Gosepi, which was going have pineapple added. In particular, pineapple juice. We squeezed two pineapples to get a little bit more than 1 liter (0.26 gallons) of pineapple juice. We didn’t use all this volume and instead we added 850 mL (0.22 gallons) to the PET bottle. Finally, as we did for the two other beers, the last thing we did was to transfer the base beer to the PET bottle, about 4.5 liters (1.19 gallons) for Gosepi. After filling the three PET bottles with base beer, we put a cap with an airlock in each one of them and we put them in the fermentation chamber, set at 18ºC (64.4ºF), so the yeast could ferment the extra sugars from the fruits we had just added. We were left over with 1 liter (0.26 gallons) of the gose base beer that we transferred to a 1.5 liters (0.40 gallons) PET bottle and carbonated with a carbonator cap to taste it. It was a pitty that we didn’t take a picture of it so you could see the aspect of this base beer. A nice golden colour, maybe a little bit sourer than the first gose we brewed, although it was a pleasant sourness, nothing too aggressive, very drinkable. 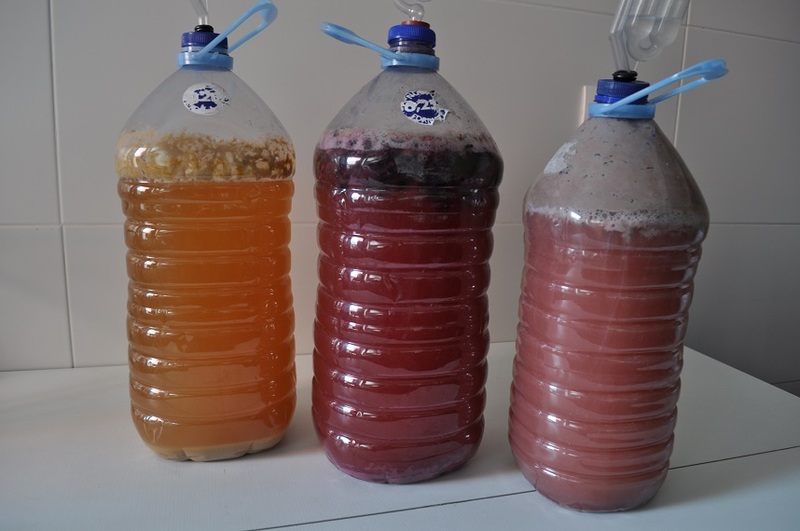 Next morning, 9-10 hours after mixing fruit and gose base beer, fermentation activity was obvious in the three bottles. In each one of them an increasing krausen was forming. The following days those krausen got smaller until they disappeared. After 5 days, it looked like fermentation was over, so we decided to bottle next morning. So 6 days passed from the day we added the fruit until the day we bottled. After cleaning and sanitizing the bottles and bottling material, we used some free time while we were brewing another beer to bottle these three beers. Gosepi and Gosemo were quite clear, whereas Gosegra had a hazier and milky aspect. We took a gravity reading and we got a little surprise. While Gosepi and Gosemo had the final gravity we expected, 1.008, Gosegra had a final gravity of 1.016. We don’t know what could have caused this difference. Maybe fermentation had stopped in this beer due to an unknown problem? Was the pomegranate molasses too hot when we added them? We didn’t have time, and although we knew we had some risk of over carbonation with this beer, we decide to bottle it. 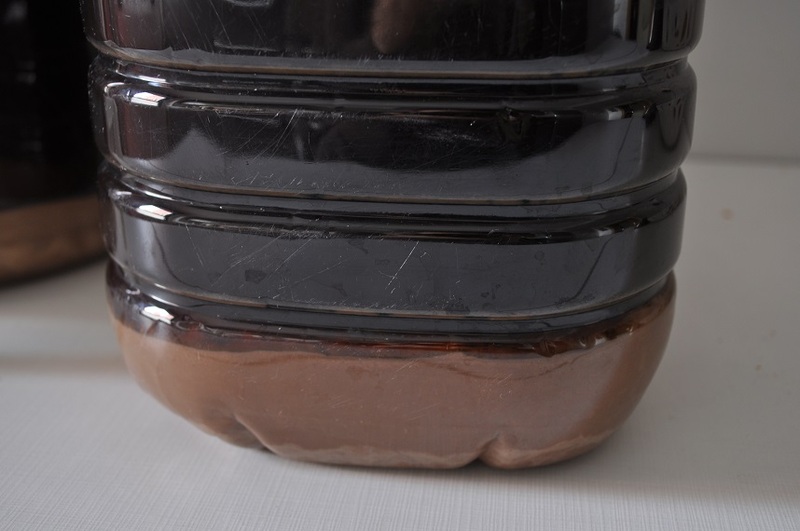 In the case of Gosegra, we added some of the yeast cake from Gosepi, just in case the problem was the yeast. With this problem in our heads, we added enough sugar syrup to get 2.6 volumes of CO2 for Gosemo and Gosepi and just half of it for Gosegra, to try to avoid an over carbonation if the fermentation was no finished. The more logical and reasonable thing to do was to wait some time, but unfortunately that was not possible, so we crossed our fingers. Finally we got 15 33 cL (12 oz) bottles of Gosemo, 14 33 cL (12 oz) bottles of Gosepi and 11 33 CL (12 oz) bottles of Gosegra, all of them with an ABV of a little bit more than 4%. We will let you know how they ended soon. Time to get back to sour beers. As the result for our first sour beer, a gose with apricots, was more than satisfactory we decided to brew something similar, but more volume this time. As we’ve already told you, we like gose more when it is combined with fruit. Since we were brewing more volume, we would be able to try different fruits with an initial base beer. To not make this entry too long, in this first part we’ll tell you about brewing the base beer, a quite standard gose beer. 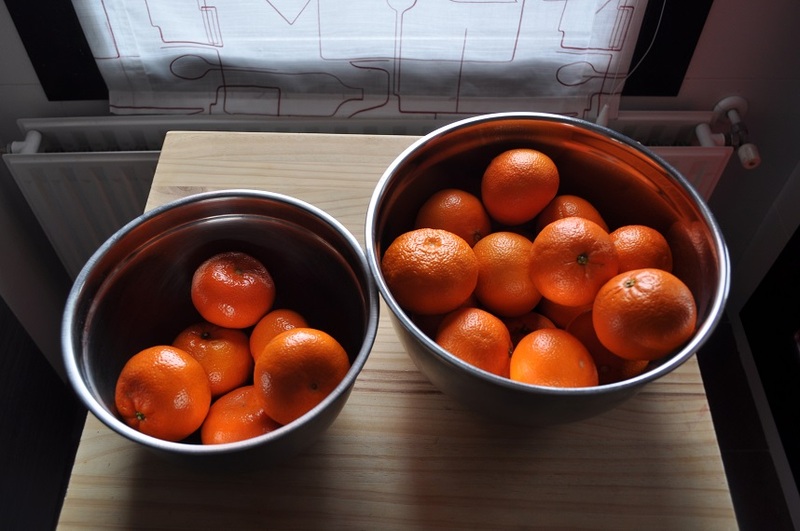 In the second part we’ll talk you about the fruits we chose and how we added them to the beer. For this brew we used for the first time an electric kettle we purchased from another fellow brewer from the ACCE (Spanish Howebrewer Association). It is a 40 L Royal Catering with a PID controller and a recirculation system. To prepare the recipe we decide to go with something very similar to what we did in our first gose beer, changing only the origin of the malts, and adjusting everything for a bigger volume. Everything except a little detail, salt and coriander, whose amount we dind’t modify in the initial writing of the recipe by mistake. We noticed it when we cooled the beer after acidification with Lactobacillus and after pitching yeast. We left coriander as it was, but in the case of salt, we tried to fix it adding the missing amount (6 g, 0.21 oz) directly to the fermenter. Below you can check the recipe and process summary for the base gose beer. Sour Pitch from Lallemand (Lactobacillus Plantarum). 3.3 g (0.12 oz) dispersed in a small volume of wort . 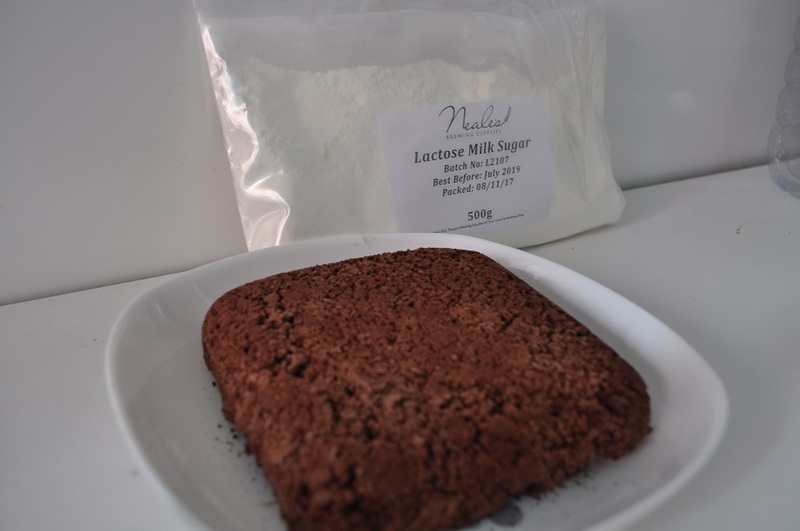 Before pitching Lactobacillus the wort was boiled for 10-15 minutes for sterilization, then was cooled to 40ºC (104.0ºF) and preacidified with lactic acid until it reached a pH of approximately 4.5. 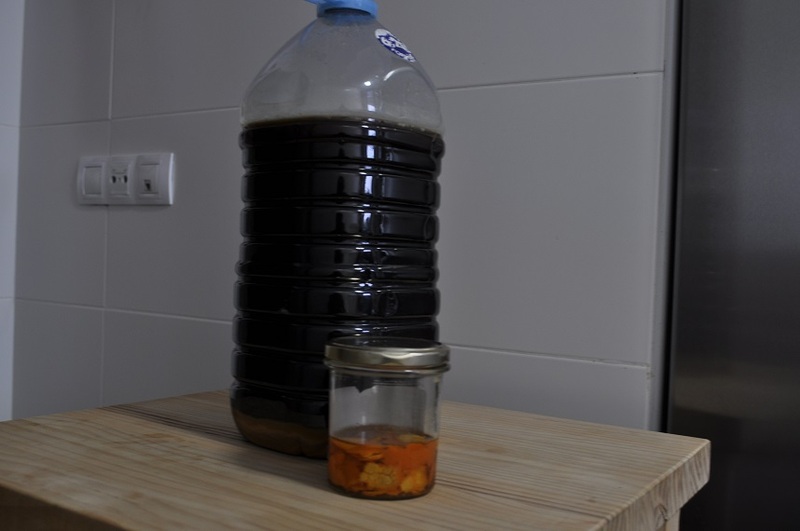 Fermented for 24 hours at 37,5ºC (99.5ºF) and another 24 hours at 30ºC (86.0ºF). After 48 hours pH was 3.30. We started the brew day boiling water to remove chlorine in the morning. 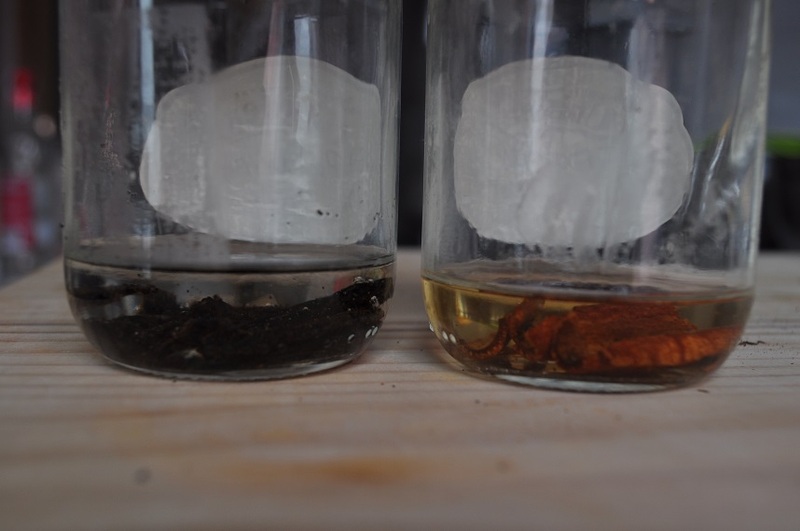 In the afternoon, to shoot for a mash pH of about 5.35 (according to Bru’n Water) and to get the water profile shown above, we added 58.8 mL (1.99 oz) of sulfuric acid and 4.7 g (0.17 oz) of calcium chloride to 23.85 L (5.25 gallons) of water. 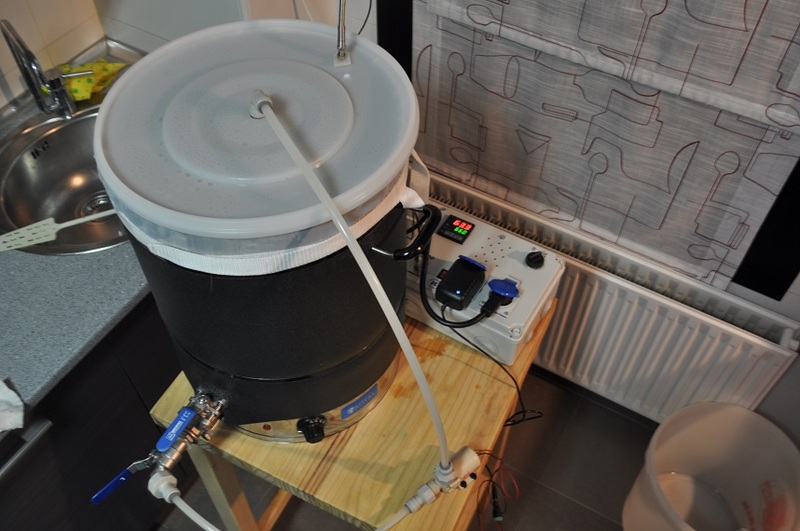 After adding grain when water was at 68.7ºC (20.4ºF), we set the PID controller to 66ºC (150.8ºF) for an hour. All this time we kept the pump recirculating the wort. After this, pre-boil gravity was 1.035 (theoretical value: 1.031). We remove the bag with the grains and we boiled the wort for about 15 minutes to sterilize it before pitching Lactobacillus. 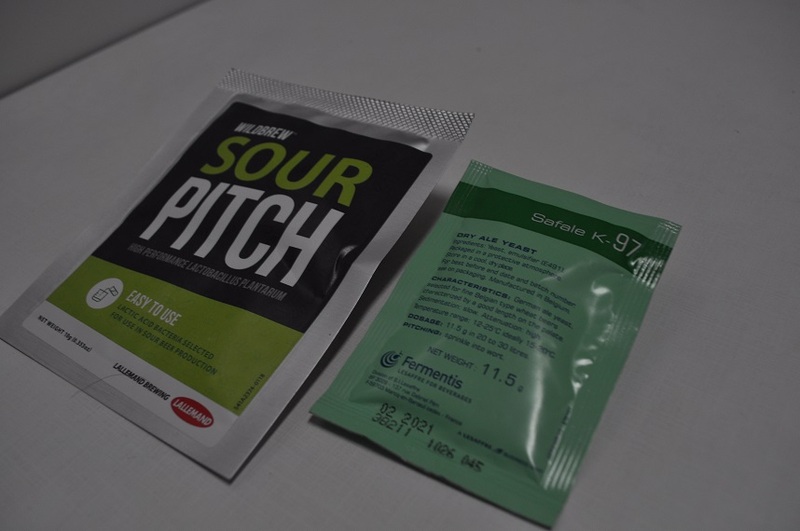 It was our first experience with the Sour Pitch from Lallemand and we stuck to the instructions they provided. 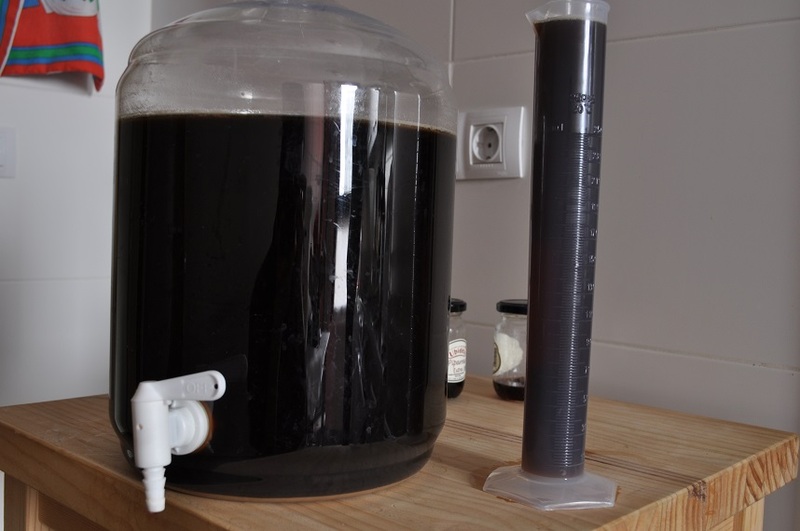 We cooled the wort with a cooper immersion chiller until it reached 40ºC (104.0ºF) and we preacidified with lactic acid to a pH of about 4.40 to avoid growth of unwanted bugs. We added 3.3 g (0.12 oz) of Sour Pitch (recommend dose is 10 g/100 L, 0.35 oz/22 gallons) for about 16 liters (3.52 gallons) of wort. We added this amount rehydrated in a small volume of the same wort. Then we set the PID controller at 37.5ºC (99.5ºF) for fermentation with Lactobacillus. We kept the spare contents of the sachet closed in the refrigerator for a future brew day. After 24 hours pH has dropped to 3.55. Since the drop in the pH value seemed to go fast, we set the temperature of the PID controller to 30ºC. After 48 hours pH value was 3.30, more or less what we were looking for. To stop acidification and kill Lactobacillus, we boiled for 55 minutes, adding 8 g (0.28 oz) of Hallertauer Tradition at the beginning of the boil, for 8.1 IBUs. Ten minutes before the end of the boil we added freshly crushed coriander seeds and salt (as I mentioned before a lesser amount that it should have been), as well as a small amount of yeast nutrients to help yeast ferment at a not so ideal pH. We cooled the wort until it reached 20ºC (68.0ºF) with an immersion chiller while we rehydrated Safale K-97, responsible for finishing the fermentation job. After cooling, we transferred the wort to a Brew Bucket fermenter and pitched yeast. It was then when I noticed that the amount of coriander seeds and salt added was not what it should have been. 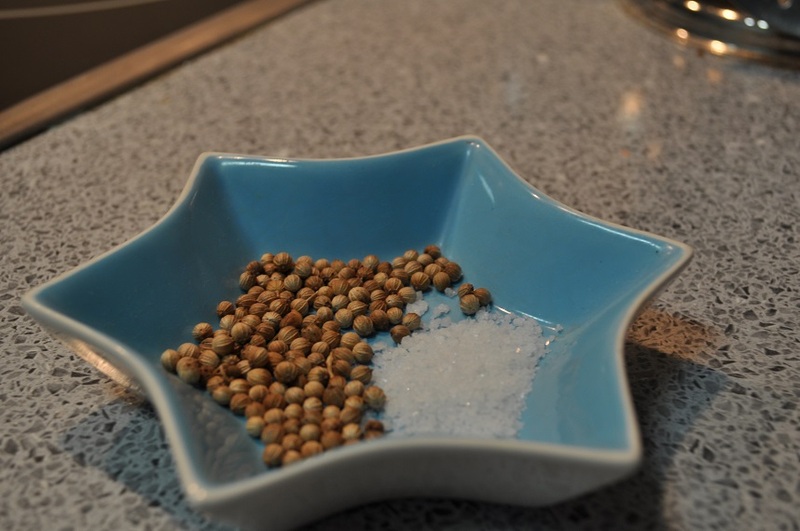 I didn’t add more coriander seeds, but I did add another 6 g (0.21 oz) of salt directly to the fermenter. It wasn’t a good day for memory, we also forgot to take a reading of the gravity at this point. 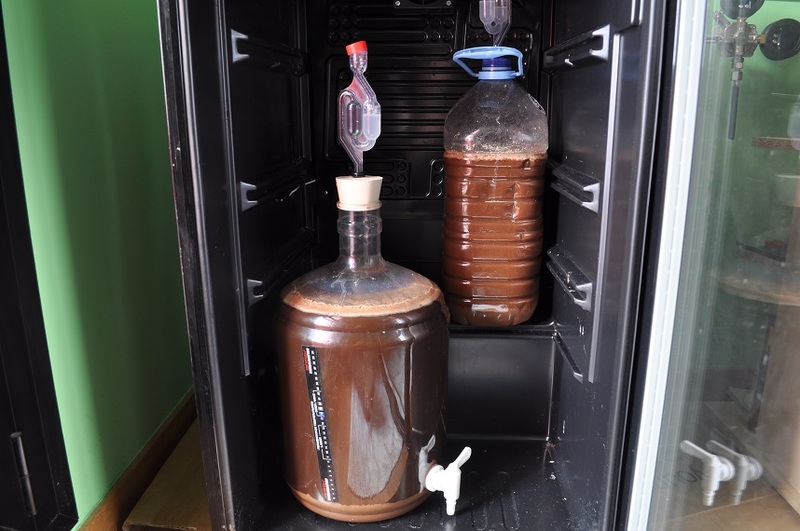 With the fermentation chamber temperature set at 18ºC (64.4ºF), the beer temperature was 19ºC-20ºC (66.2ºF-68.0ºF) during the most active part of the fermentation. After 3-4 days the temperature started to drop and 6 days after pitching yeast we decided it was time to divide the beer in three equal parts to add fruits. We’ll tell you about that in another entry, although as an advance you can see in picture above which the fruits we added this time were. First entry of 2019 is going to be for the tasting of the Oat Pale Ale we brewed more than a year ago and that is already finished. 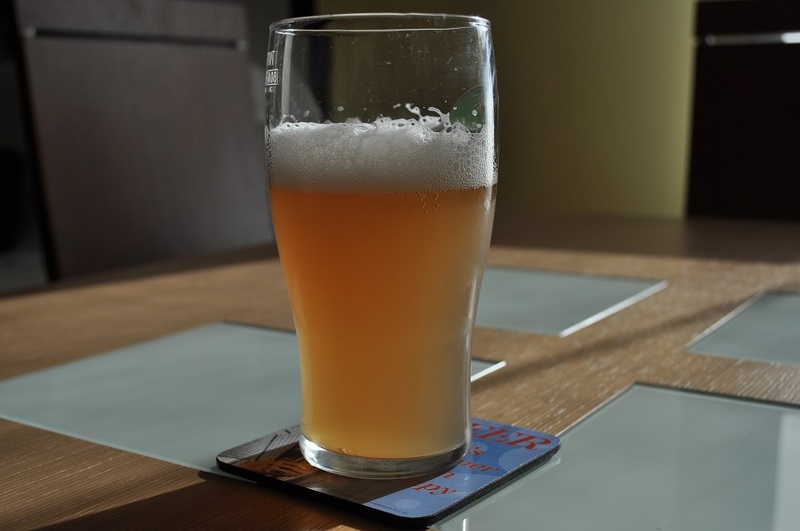 But before getting into it, I would like to take this opportunity to wish every reader of this blog a great new year, hopefully drinking a lot of great home brews. The reason for this to be the first entry of 2019 is in part due to chance, but I’m glad this beer is the one that starts this year since it has been our favourite beer from all the ones we’ve brewed through these years. We liked it so much that we have decided to make a series of beers following the scheme of this one (we’ve already brewed the second one, I will write about it in a few weeks) whose name is going to be OP Series (Oat Pale Series). As those of you who read the entry about brewing this beer would remember, we took inspiration from a beer from Pilot we drank in Scotland. 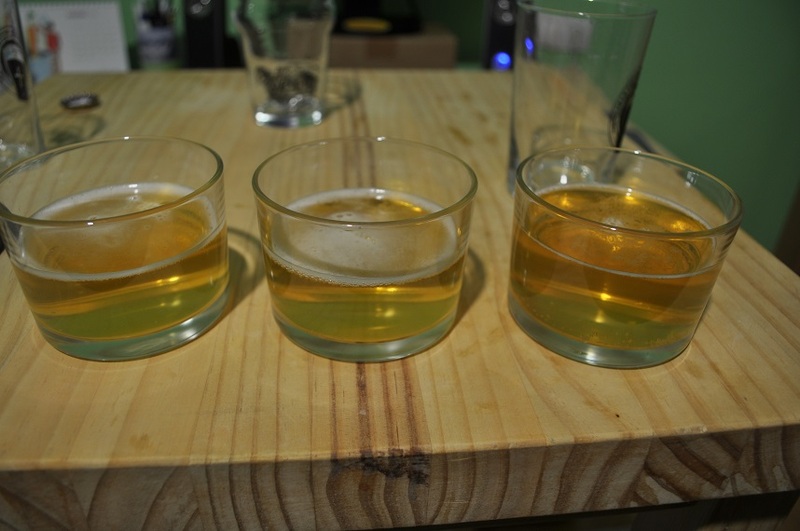 Our objective was to brew a low alcohol beer, with a smooth mouthfeel and lots of aroma. Appearance, as expected from the high percentage of malted oats, is hazy, with a nice golden colour. Foam is white, with medium-high retention. Very fresh citric and tropical notes in aroma. Citra hops, that smelled beautifully when we opened the bag on brewday, really paid off. There are also some esters probably from the yeast (Vermont IPA) and some hints from the malt. Aroma diminished with time, but this loss was less marked than with other hop forward beers we’ve brewed. More or less the same characteristics are found in flavour, with Citra as the star of the show. Lots of tropical fruits, some citric notes and a bit of peach, the latter maybe produced by the yeast. Bitterness is on point and it balances sweetness from the malts very well. Base malt and malted oats give some biscuity and bready notes. In spite of the great aroma (really great when the beer was fresh) and flavour, what we liked most about this beer was its mouthfeel. It has a spectacular texture, pretty smooth from the high percentage of malted oats. A medium carbonation complements this mouthfeel in a very good way. Body is medium-high, which masks its low alcohol content perfectly (a beer of only 3% ABV). All of the above is what made this beer so special for us. 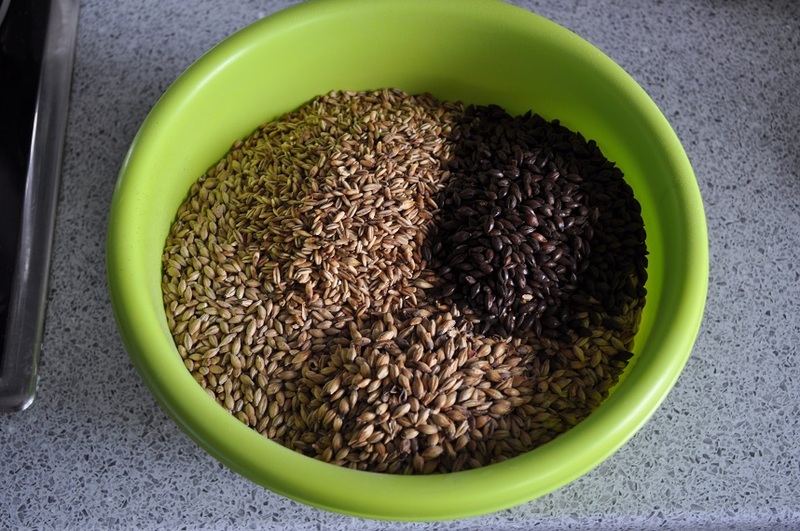 As commented before, we will work with new versions of this recipe to try different malts and hop combinations, keeping the proportion of malted oats and the yeast (at least in the first versions). The only drawback of this beer was that maybe it would be rounder if we had had a better efficiency (the theoretical ABV was 4.4%). For future brews of this series we will look for some trick to improve this aspect (well, at least on the third one, since we had the same problem with OP Series #2). Milling barley malt and malted oats separately could be a good starting point, since the size of these grains is quite different. Whatever we do, we will tell you about it. Again, happy 2019 to all of you. Cheers! After finally deciding to brew our first sour beer at the end of last year, we were eager to finally taste the final result. Especially having into account that, at least theoretically, the parameters of the process we had followed seemed to have not stray from the right ones. If you want to check how we brewed this beer, you can read everything about it here. First of all, I have to explain something about its appearance. As you probably know, we had some trouble to separate completely the beer from the apricot purée. This involved that some fruit dregs were present in the bottles. After some weeks at cold temperature these dregs deposited at the bottom of the bottles and, if you were cautious, you could serve this beer with a nice golden colour and quiet clear. However, if you shook the bottles just a little bit or if you poured without caution, the beer was hazy and with an orangey colour. You can see the differences in picture above. Foam is white and with low retention. Regarding aroma, fruit is the most prominent characteristic, with a mix between apricots and citric tones. The acid touch from Lactobacillus is also present. There is no aromas coming from the yeast. For flavour, a firm but rather smooth tartness is the first impression you get. Soon you can notice the apricot that, in my opinion, balances the acidity quite nicely. Wheat malt imparts some bready hints and, as with aroma, there are also some citric notes, maybe from coriander. Bitterness is quite low, just enough to balance malt sweetness. Safale K-97 yeast did a pretty good job performing a clean fermentation. Salt is not noticeable, but I have the feeling that this beer wouldn’t be the same without it, since it is probably enhancing other flavours. Body is low-medium, with a medium-high carbonation. It is a very dry and refreshing beer, which makes it very drinkable, especially with good weather. In addition, its low alcohol content, 4.2% ABV, allows you to drink a few glasses without any danger. The fruit dregs, contrary to what it may seem, are not noticeable while drinking the beer. In fact, we preferred the “hazy” version with the fruit that the “clean”. All in all, we are very happy with this beer. Of all the batches we’ve brewed these last years, this is probably in the top 3. I’m very proud of it and I must say we enjoyed it from the first to that last bottle. Maybe all of this is because it was our first sour beer, something different from what we are used to brew, but the fact is we are very glad with the result. For future versions and, in spite of being something that didn’t really bothered me, I would probably change the way in which we added fruit. Although some fruit dregs remained in the final beer, it was quite tedious to separate most of the fruit from the beer. We could also play with other type of fruits. For the rest of the process, I will keep it more or less the same, only minor changes. If this beer was a test to keep brewing sour beers, with the final result I have no doubt that sour beer have arrived to stay. This time last year, intrigued by reading several blogs, especially Larsblog, we decided to brew our first beer fermenting with kveik yeast. If this name doesn’t ring a bell, you can read our entry about brewing a vossaøl, a Norwegian farmhouse ale, emulating a traditional method. You should be able to find a lot of information about kveik there. First of all, let me clarify one thing. As you can see in the entry about the brewing of this beer, we split the wort in two. 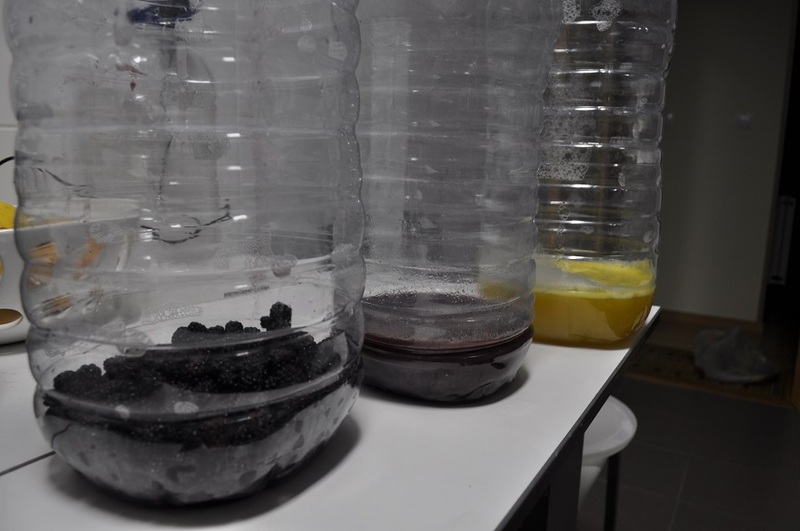 Each of them was fermented at slightly different range of temperatures, one of them at 30ºC-35ºC (86ºF-95ºF) and the other at 25ºC-30ºC (77ºF-86ºF). 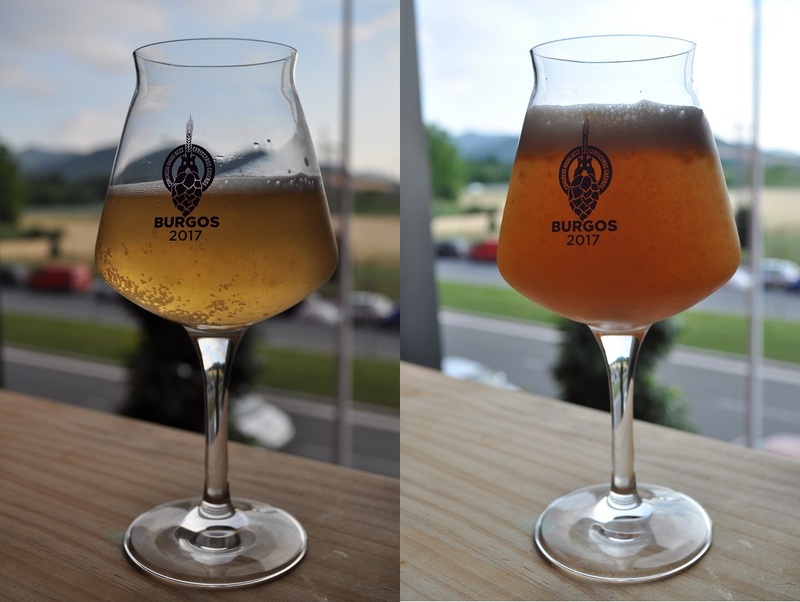 Once we tasted both beers, we weren’t able to find any differences between them, both were pretty similar beers at least for our palate. We even performed a triangle test with a friend and none of us was able to identify the unique sample. Taken this into account, the following characteristics should apply to both beers fermented at different range of temperatures. Regarding appearance, although in picture above with juniper bushes the beer looks a little more dark and quite hazy, the thing is that this beer was light golden in color and more or less clear. Haziness in the picture was probably due to yeast in the bottom of the bottle and beer mixing due to movement. Below you can see another picture from the day we made the triangle test, so you can compare. 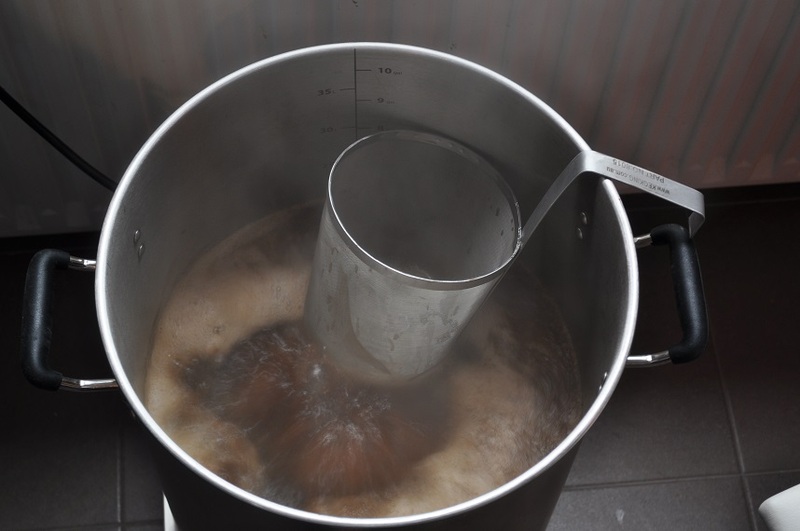 After brewing the beer, we contacted Lars Marius Garshol to tell him about our experience and he told us that it was too clear compared with traditional examples, since those are usually amber in colour and that this was probably due to the boil time. Although we boiled for three hours, in this type of beer is not unusual to boil for four hours or more. In addition to this, since lautering takes quite a bit, some parts of wort are boiled form even 6-7 hours. According to Lars, this extra boil time is what justifies the difference in colour. The leading role in aroma is without a doubt for juniper, with pine and citric notes. 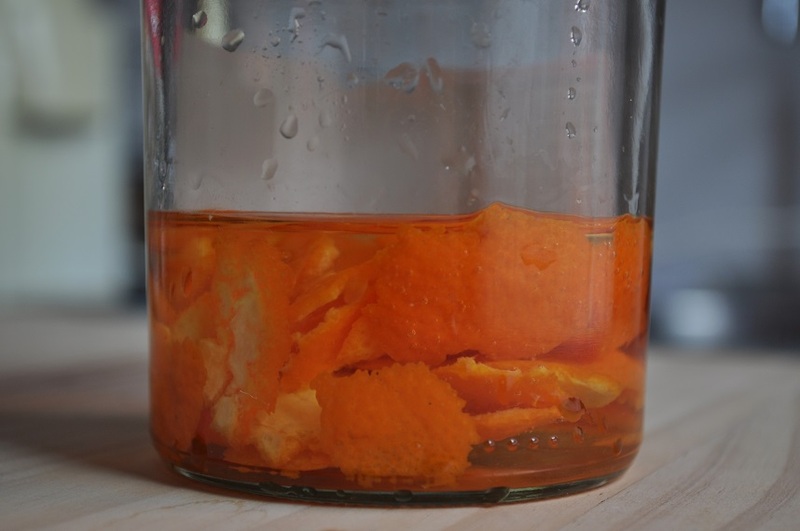 These citric notes, along some orange could also be due to the kveik yeast, according to what we had previously read about it, although we can’t be sure. No signs of malt here. 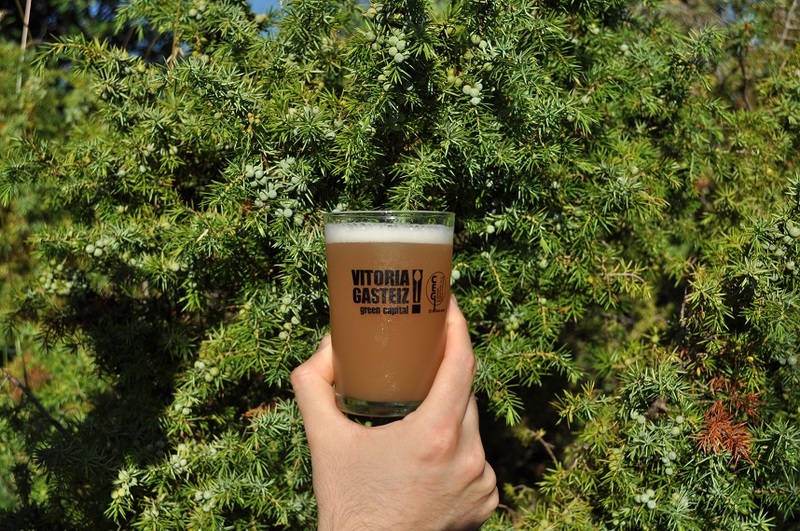 It has a low-medium body and high carbonation, with a very dry finish, almost champagne like, what makes it a very refreshing and easy to drink beer… if it wasn’t because of the powerful flavour of juniper, that predominates even more than in aroma. This flavour is something you either love it or hate it. It is a very characteristic flavour, a mix of pine, resin and citric notes, with a gin-like bitterness. When we brewed it we wonder if the amount of juniper was too much, and once we had finished all the bottles we can say that happened to be true. If we brew this recipe again we’ll lower the amount of juniper for sure. But there’s more, some malt shows timidly and some orangey notes are also appreciable, maybe related to the kveiv yeast. One thing I would like to point out is that, despite the high temperatures of fermentation, there are no defects or off-flavours of any kind, confirming us that this type of yeast are something special. A lot of people was able to taste this beer, with mixed reactions. Some people liked it and others couldn’t even finish the beer. I personally didn’t dislike it. Even with the strong juniper flavour, which faded out with time, I drank quite a few bottles of this beer quite happy. The fact that it was very dry and easy to drink helped with that. Without a doubt, brewing this vossaøl following a traditional method was a great experience. Brewing beer like they do in other parts of the world always contribute to broaden our knowledge about beer. We don’t know if we will brew a beer with this method again, since it takes a lot of time, but you never know. On a final note, the best two things we got from this experience. First one, now we are more interested in working with kveik yeast than ever, particularly with no commercial strains, since those are purified strains. We would like to work with original strains, the same that they keep using in farms in Norway, which usually have more than one strain (some of them even some type of bacteria) and consequently contribute more complex characteristics to beer. And second, juniper. We had learn a lesson on how to use juniper in beer, especially about the amount to use. I think that on an adequate proportion can impart a lot of good things to several styles of beer.